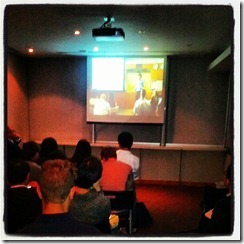 Last night the first AcceleratorHK cohort had its “graduation” Demo Day at the Time Warner Center in Hong Kong. An accelerator is meant to speed up a startup’s progress over what they would have done on their own. Studies show that accelerators double or even triple the progress you would have made on your own. The goal is that if you are in a 3-month accelerator you should accomplish what you would have done in 6-9 months. Our teams in AcceleratorHK did exactly that, working on their Business Model Canvas for weeks (specifically on their segments and value proposition) and starting to build out their offering. We were oversubscribed and about 175 people crowded into the Time Warner offices and we had to have an overflow room with live streaming. Paul and I kicked it off with a short introduction as to what AcceleratorHK is, how an accelerator works, and what Demo Day is all about. Then the teams started their presentations. Next up was PayAllies with Carlos Grajeda aka “Carlos 2” as the presenter. This was Carlos’ first presentation in English! PayAllies is from Mexico and is solving the unbanked problem since only 17% of Mexicans have credit cards and 34% have bank accounts. They are like a debit/gift card/Google Wallet meets the Octopus card for Latin America. PayAllies is AcceleratorHK’s first success story, immediately after graduation they are headed to the Chilean incubator, Startup Chile for six months. Our third presentation was SurroundApp with Jeffrey Broer as the presenter. Surround solves the problem of English speakers wanting to engage with Chinese social media (half a billion Weibo users!) What is pretty cool about SurroundApp is that they can even translate slang into its “street” or common usage. After that was Dynamino Lau Kok-hwa aka “Special-K” as the presenter. 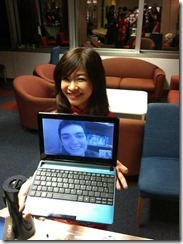 Dynamino is a new marketing campaign creation app that allows people to spread their campaigns by word of mouth. In their testing they found out that they were equally as effective as Facebook ads but 23x less expensive! 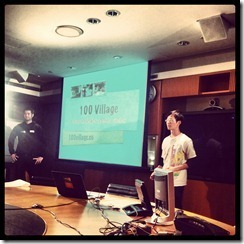 The penultimate team was 100 Village with Nick Wang as the presenter. 100 Village is a social venture that is focused on the Reggio Emilia approach (REA) to early childhood education. Nick gave a very passionate and inspiring speech about how schools are killing our kids creativity and how something as simple as playgroups can make a huge difference with the kids’ development. 100 Village’s app is “meetup for moms” where it helps facilitate the organization of REA style playgroups. Last, but not least was GOnnect with Furuzonfar aka “Foobar” as the presenter. 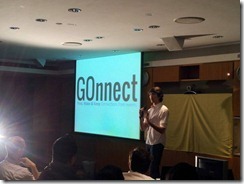 GOnnect is an app that helps you find, make, and keep connections at an event. They solve the problem of who you should talk to at an event by matching you up with someone to network with and making it easy to connect with them later on via LinkedIN or something similar. Finally we can do away with business cards! 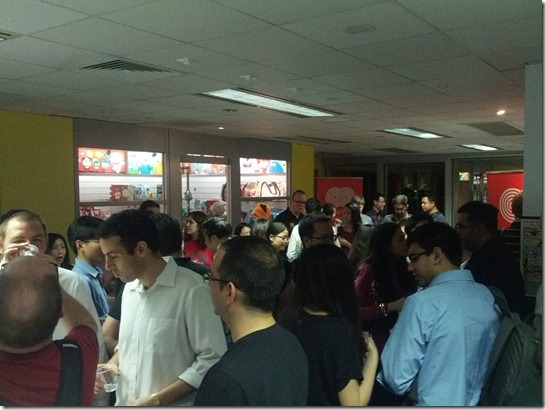 After the presentations, we had a reception for the audience to come and meet the teams at their booths. In order to force the audience to mingle and network with the teams, we provided cold beer at each of the teams’ table. 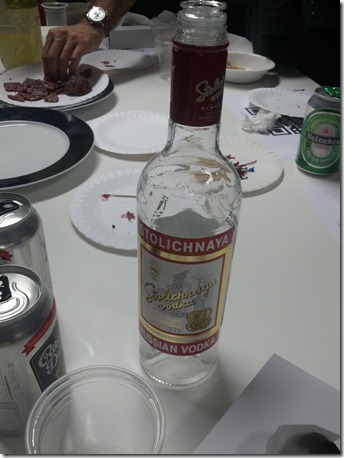 In addition, each team had a drink and food from their home country. The teams were mobbed! Carlos Rivera aka “Carlos 1” had to head back to Mexico to get his visas for Startups Chile so he could not attend, but we Skyped him in all night. Here he is talking to potential investors. I was surprised by the amount of investors, media, and government officials that attended. Maybe they just wanted the free vodka that Team GOnnect provided. 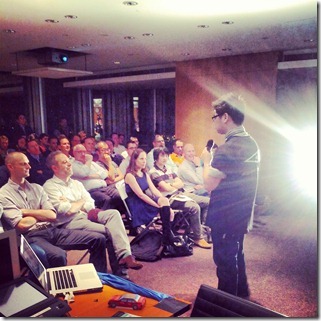 AcceleratorHK Demo Day This Wednesday! 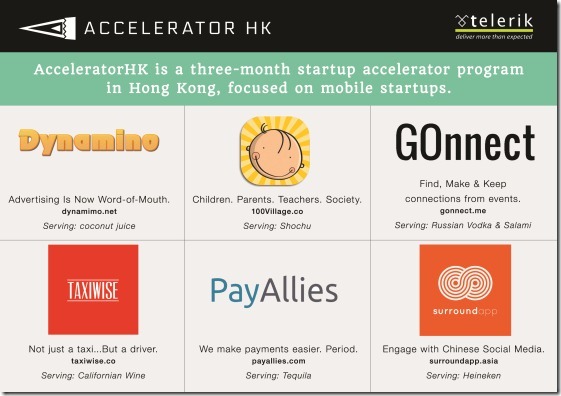 In November, six new startups entered AcceleratorHK, Hong Kong's first startup accelerator -- and the world’s only accelerator focused on hybrid mobile development. I can’t believe how fast it all went by! 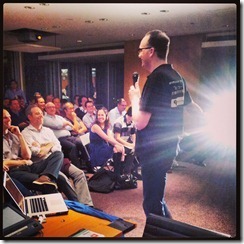 After 14 weeks, the AcceleratorHK cohort is graduating at Demo Day on Wednesday 06 Feb.
7pm (sharp! ): Introduction by Stephen Forte and Paul Orlando, program organizers. 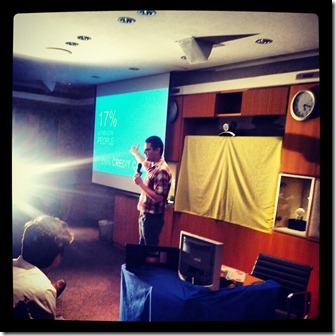 7:10pm: Presentations by the six startups, seven minutes each. No Q&A by the audience. 8:15pm to 9:30pm: Meet and greet each team. Each team will be in a conference room where you can go and ask questions, get a demo, and of course, get a drink! Each team will be serving a drink from their home country and AcceleratorHK is providing beer and soda in the conference rooms as well. Please arrive early! We only have 85 seats in the main room, all late comers will have to go to the live streaming overflow rooms (we have room for 75 more people there.) Since we are being hosted by Time Warner Asia, the live streaming will be in super quality HD, CNN lent us a high tech splitter!